Downtown Nashville will be Football City with NFL Draft activities taking place April 25 - 27. Downtown Nashville will be bustling with lots of festive football fun when the NFL Draft takes place April 25 - 27. 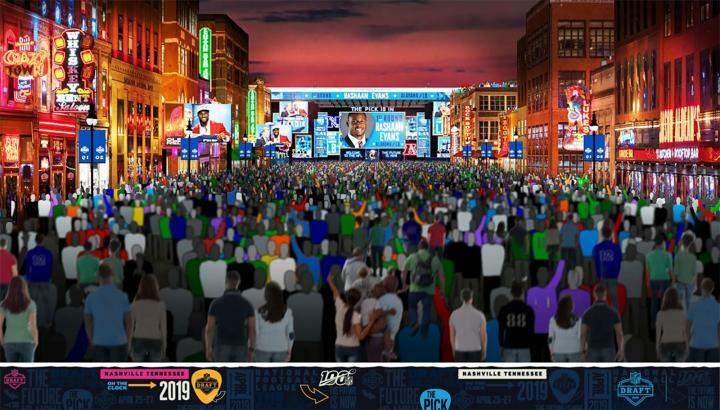 A giant stage will reside at the end of Lower Broadway for the draft itself. In addition, the three days include free family activities in the NFL Draft Experience at Nissan Stadium. WHAT IS THE NFL DRAFT? Every year, the NFL hosts a draft where teams can add or recruit new members to their squad. Teams select from the top prospects in the country. Round 1 — Thursday, April 25 at 7 p.m.
Rounds 2 & 3 — Friday, April 26 at 6 p.m.
Rounds 4 - 7 — Saturday, April 27 at 11 a.m. The draft will also be televised nationally by NFL Network, ABC and ESPN. The NFL Network will also broadcast behind-the-scenes footage in town. In conjunction with the draft activities, more than 20 musical acts will perform, including headliners Tim McGraw and Dierks Bentley. 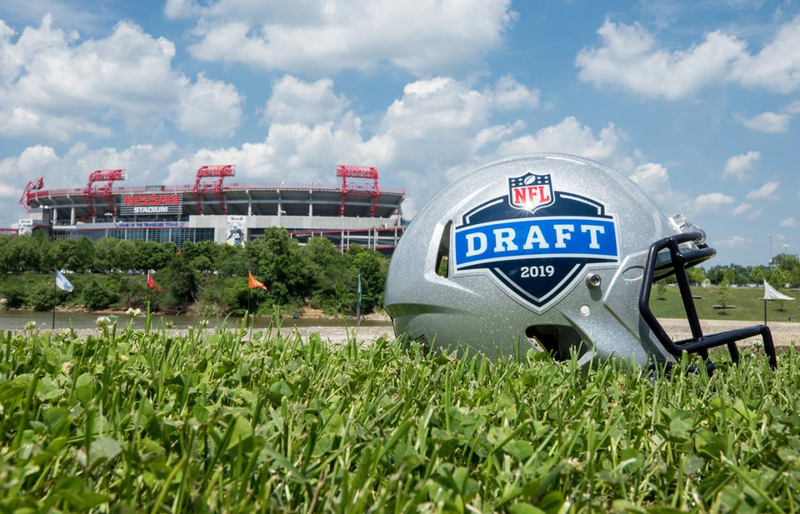 “We are confident that this year’s NFL Draft will be an unforgettable experience for our fans and the entire Nashville community, showcasing an exciting fusion of football and music,” says NFL Executive Vice President, Club Business & League Events, Peter O’Reilly. 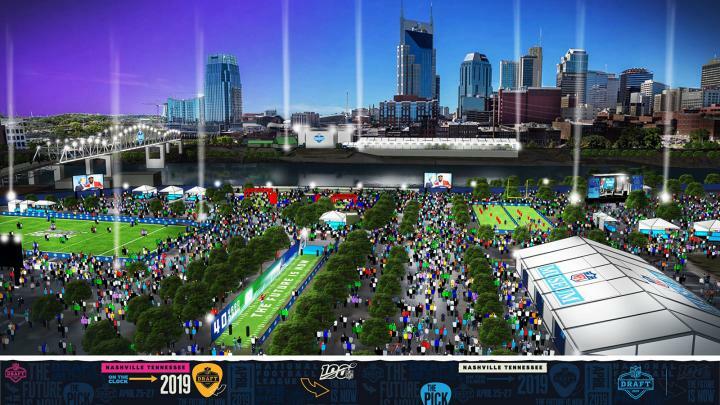 A rendering of the NFL Draft Stage in downtown Nashville. The NFL Draft Experience is a three-day FREE football festival for families and fans of all ages. Located at Nissan Stadium, the Draft Experience includes immersive games, virtual reality experiences, autograph sessions with current NFL players and NFL legends, football clinics for boy and girls ages 6 - 17, and more. The Draft Experience is open Thursday from 12 - 10 p.m. (or end of draft round 1); Friday from 12 - 10 p.m. (or end of draft round 3); and Saturday from 9 a.m. - 6 p.m. (or the conclusion of the draft). A rendering of the NFL Draft Experience at Nissan Stadium. Follow all of the fun and action with the Fan Mobile Pass app. 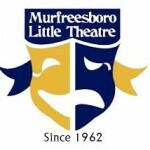 It serves as the central hub for info, updates, concerts and more. The Fan Mobile Pass will be available in mid-April, but you can register for it now at nfl.com/fanmobilepass. All registrants will be notified as soon as the app is available. For more info about the NFL Draft, visit nfl.com/draft. For more on the NFL Draft Experience, go to nfl.com/draftexperience.